This year, we were thrilled to have scholars and finalists across APAC join us at Google Sydney and Google Beijing for a retreat consisting of workshops, technical talks, panel discussions, a hackathon and lots of networking opportunities. We invited 3 scholars to share their excitement. What was your motivation for applying for the Google Anita Borg Scholarship? Hyesoo: After I read the summary of Dr. Anita Borg’s life, I felt for the first time in my life as if I had found someone who had the same enthusiasm in computer science as I do. I was nervous about applying for a global scholarship. However, I decided to do my best because I was sure that whatever the outcome I would learn and grow in the process. Luyi: I was excited to see the Anita Borg scholarship acknowledge female students’ outstanding performance in technology development and I was very passionate in research and technology in computer science. 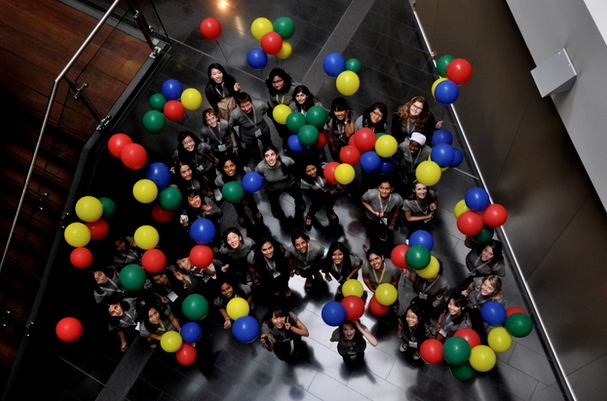 In your opinion, what is the highlight of being a Google Anita Borg Scholar? Hyesoo: For me, it is the opportunity to go on a retreat where I met female students and Google Engineers from around the globe and share each other’s enthusiasm and interest in computer science. Rijurekha: After listening to the speakers at Anita Borg retreat, the power of “applied algorithms” and “applied machine learning” overwhelmed me. Good theory, coupled with careful system implementation, can create a huge impact. The highlight of being a Google Anita Borg scholar is a new realization that systems are good, but to make it great I need to couple it with good theory. Share with us your “magic moments” at the retreat. Luyi: I like the technical talks given at the retreat as it covers various projects that Google was working on these years. I was also impressed with their catchphrase, “do cool things that matter”. Keeping this in mind, I believe that with upcoming and new technologies we will be able to contribute and make our world a smarter and better place. Rijurekha: The maps and search talks did a nice job of outlining the core algorithmic and systems challenges in both the areas, defined the main sub-problems and gave fairly intuitive ideas about how Google goes about solving them. Complex dynamic graph algorithms or 3D point cloud vision algorithms working at that scale at that speed, simply blew my mind away by the sheer beauty and power of computer science theory and computer systems working together hand-in-hand. In what way has the scholarship had an impact on you and your future in technology? Rijurekha: The interaction with the Googlers during the retreat has definitely boosted my positive energy manifold. When a senior Googler with a PhD, smiles mischievously and says “drinking from the firehose (a common phrase to describe information overload at Google) is great, because there is so much more opportunity to learn”, that really inspires me. It is so easy to get into our own comfort zone and stagnate, so contrary examples like this Googler inspires a lot. Luyi: After meeting with so many talented female students and successful female engineers in Google, I’m confident that, as females, we can also do things that matter and lead the technology development of the world. Any advice for students who are keen to become our next Anita Borg scholars? Luyi: Be passionate in technology and put your mind to being a leader in technology development. Hyesoo: Don't lose faith in your enthusiasm but rather challenge yourself by applying for this scholarship. Hyesoo: I’m planning to apply for a Google internship position after I develop a higher level of programming language and algorithm skills. I will also continue working on the brainwave research which I’m doing personally and will keep challenging myself by becoming involved in various interesting projects on my own before I become an actual engineer. Rijurekha: I am open to both academic and industrial job positions in the future, the foremost preference being to be with excited people in energetic work environments. And changes, with no comfort zone and no stagnation are welcome. Applications for APAC 2014 Anita Borg Scholarship will open in early 2014. For more updates please follow us on the Google Students Blog. Dr. Anita Borg believed that technology affects all aspects of our economic, political, social and personal lives. A technology rebel with a cause, in her life she fought tirelessly to ensure that technology’s impact would be a positive one and passionately believed in working for greater representation of technical women. As part of Google’s ongoing commitment to further Anita Borg’s vision to revolutionize the way we think about technology and dismantle barriers that keep women and minorities from entering computing and technology fields, we are excited to recognize and congratulate the 92 Google Anita Borg Memorial Asia-Pacific scholars for 2013. The full list of scholars can be found here.